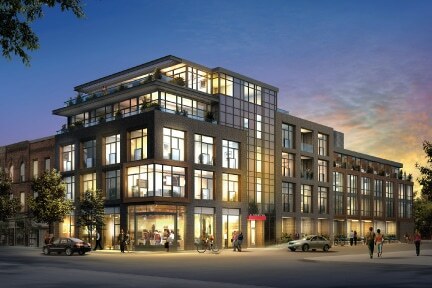 A rare opportunity for an ultra-wide town home in the heart of Queen West / Ossington Village. Townhome #5 at Motif, ready for occupancy this summer. This town home provides over 3000 square feet of living space, and two terraces totalling over 500 additional square feet. Two car parking, including a direct access space. Private entry from quiet Rebecca street, pushed away from Ossington Avenue. This unique layout is distinctive because of it’s shape, and exposures. Almost 30 feet wide, the home boasts south, east and north exposures, and is spread over 3 full floors, serviced by a convenient elevator. On the main level, you will find a spacious open-concept layout, with oversized Scavolini kitchen, tremendous dining room and living room space, a powder room and closet space, together with a walk out to a private urban garden. One level up is the sleeping level, which is configured with three bedrooms – including a master bedroom with luxurious ensuite bathroom. Laundry has also been located on this level. The top floor is an open-concept loft – ideal as a home office, media room, gym or guest suite, with exceptional city views. This level also features it’s own south-facing terrace.